The Virginia Tourism Corporation (VTC) in cooperation with the Virginia Department of Transportation provides an invaluable opportunity to showcase your destination or organization and gain valuable hands-on exposure with Virginia Visitors. 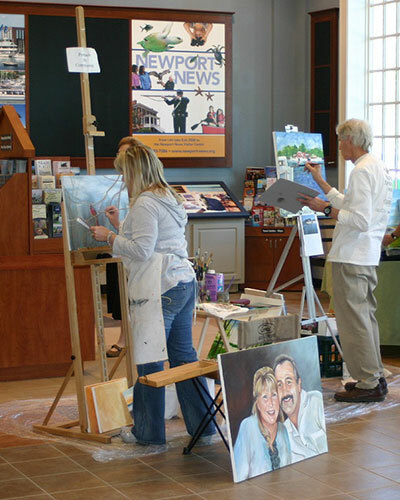 The majority of our Virginia Welcome Centers permit industry partners to sponsor a Demonstration or Exhibit. There is no investment required to participate. It’s just another way that VTC supports Virginia’s travel and tourism industry. Only Exhibits/Demonstrations that promote the overall mission of the Virginia Tourism Corporation and its Virginia Welcome Centers may be conducted at a Welcome Center. Exhibits/Demonstrations will focus on activities and/or locations that promote travel, tourism and highway safety within the Commonwealth of Virginia. Exhibits/Demonstrations may be used to promote festivals, heritage & culture, music, local and regional communities, and tourist destinations in general. Other types of Exhibits/Demonstrations may be considered at Virginia Tourism Corporation’s sole discretion, provided it can be demonstrated to the VTC’s sole satisfaction to promote tourism in the Commonwealth. The Demonstration/Exhibit sponsor(s) shall not display or distribute materials that are inconsistent with the basic mission of Virginia Tourism Corporation. The promotion of political opinions, personal opinions, religious beliefs and personal advancement is prohibited. The determination of Welcome Center Demonstration/Exhibit eligibility will be at the sole discretion of VTC and its respective Tourism Relations Manager(s). The Demonstration/Exhibit must be conducted during the normal working hours of the center while Virginia Tourism staff is present. No industry partner may schedule more than two (2) demonstrations/exhibits per week or a maximum of 10 exhibits per month, including no more than two (2) Fridays or Saturdays per month. A representative of the sponsor(s) must be on site during the time of the Demonstration/Exhibit. Welcome Center staff may not be used to support the Demonstration/Exhibit without the expressed written consent of the VTC. Should the Demonstration/Exhibit sponsor require assistance from VTC staff, approval must be requested in writing in advance. The Demonstration/Exhibit sponsor(s) must provide any necessary equipment and supplies. Artisans and craftsmen may conduct demonstrations; however, the unsupervised display of art or crafts is prohibited. The Demonstration/Exhibit shall not be set up in such a way as to impede the movement of Welcome Center visitors. The Demonstration/Exhibit sponsor(s), volunteers or paid staff shall not serve or consume alcoholic beverages, use illegal drugs or materials, solicit contributions or charge for admission or materials during the Demonstration/Exhibit. The VTC reserves, at its sole discretion, the right to cancel, extend, or shorten any Demonstration/Exhibit at any time for any reason and without cause. It’s easy. Just download the VWC Demo Event Request Form (word doc). Review and complete the form. Then mail or fax it to your 1st choice Virginia Welcome Center location. (It must be mailed or faxed as a signed copy is required.) The Tourism Relations Manager from your requested location will contact you to confirm or discuss your request. Please submit all request at least 14 business days prior to your requested date.